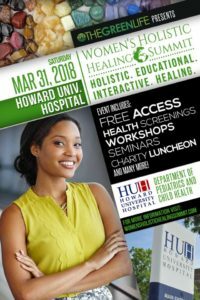 The Green Life Learning Center in partnership with Howard University’s Department of Pediatrics presents the Women’s Holistic Healing Summit (WHHS) Saturday March 31st 2018. The WHHS is a day of exhibitions, health screenings, lectures, workshops and seminars about holistic health practices for women of all ages. VIP Charity Luncheon : All Proceeds go towards HUH Boarder Babies Project. We expect at least 50 woman owned businesses to participate as vendors, and will advertise on radio and print media to the DC commuter and metropolitan area. We anticipate over a thousand participants attending throughout the day, and will live stream to an international audience. The Green Life Learning Center is an online resource center committed to educating the community through agriculture, nutrition, holistic, and economic courses on the numerous ways we can experience sustainable life. Founded by Jay Mills in 2016, educational seminars have been conducted in LA, Oakland, Las Vegas, Washington DC, and numerous locations in Jamaica, West Indies. A “boarder baby” is defined as any pediatric patient who remains hospitalized without medical problems to justify the prolonged stay. US Department of Health and Human Services reports 10,000 “boarder babies” are deserted yearly in hospitals nationwide. The Howard University Boarder Babies Program was established in 1989, to provide support services for children born in unstable home environments.